One Bedroom Cottage Close To The Beach. Our cottage is a lovely Hawaiian beach style home. We just completed a renovation which we know you will enjoy. Fresh linens, beach chairs and umbrellas. cable TV and a outdoor shower, Just a few of the amenities we have provided. Our comfortable, Hawaiian-style cottage is across the street from the tide pools and ocean access in the quiet community of Puako. Over the years, we have collected surfboards and other bits of old Hawaii to add charm and privacy to this cozy little place. The cottage includes a fully stocked kitchen with comfortable seating and everything you need to prepare a lovely dinner for two. The bedroom has queen-size bed and quality linens. The bathroom is large, but incase you feel like more room or a bit of romance, there is also an outside shower enclosed by tropical plants and flowers. This is very comfortable and affordable for two people. We also have an apt below this rental..one bedroom, sm kitchen and living space. We are retired now. raised our son and daughter on the Big Island and love to travel between the Islands and Colorado where we have family. Puako is a very special place to us and our children who are finding their way back after college and work on the Mainland. That makes us happy, especially now that we have a grandchild! We fell in love with Puako in the early 70's when we spent a few weeks here. Found a real-estate agent and bought this property. moved a few years later and here we are. We thoroughly enjoyed our week here. The apartment was very nice and well cared for. Peg was a great host and we enjoyed the community sunset gatherings and relationships. Highly recommended! Charming vintage Hawaiin style apartment located in a sleepy residential village perfectly situated to best beaches and for making excursions around the island. Our host Peg was lovely and accommodating offering us use of beach chairs, umbrellas, etc. House has everything one needs for a comfortable stay including wi fi, dishwasher, washing machines, bbq, bicycles, outdoor shower. Best part was the superb location close to all the best hotels and services on the island and within easy driving distance to colorful farmers markets and local activities and restaurants. Wonderful. Tranquil, relaxed, good snorkeling. Extremely well appointed and maintained. Very welcoming and friendly. Great vacation cottage in a relaxed & quiet area! This is a great cottage nestled along a dead end road than runs adjacent to the shore line. The apartment is located on the second floor of a 2-story cottage. We stayed here for 8 nights in January 2018. The photos posted on VRBO capture it perfectly – cozy, bright and airy. The building and its appliances are older but well maintained, and the unit is clean (The fridge door looks to be rusting and could use some TLC). The kitchen is very well equipped and the closets are stocked with an abundance of clean linens and towels. We enjoyed the delicious breeze that flowed through the apartment day & night and only required the bedroom air conditioner one night out of our 8 day stay. The screened sunroom with its comfy day beds was a favourite location to read or take a nap. Peg and Bud are kind & lovely hosts who greeted us warmly. They reside in the main house located on the property. The pace of Puako Beach is very much like a “summer village” – friendly, casual and laid back. When I booked this stay online, I was a little concerned with apartment’s location alongside Puako Road. However, my concerns were unwarranted. Trees & bushes alongside the cottage provided ample privacy. The road is local traffic and pretty well shuts down by 7PM. We slept with the windows open and the only sound we would hear in the morning was the francolins (birds) rather than any automobiles. There are a number of beach access points within walking distance. The shoreline is rocky with an abundance of sea turtles. No need to take a whale watching boat tour – we would watch them from the shore –it was absolutely spectacular! 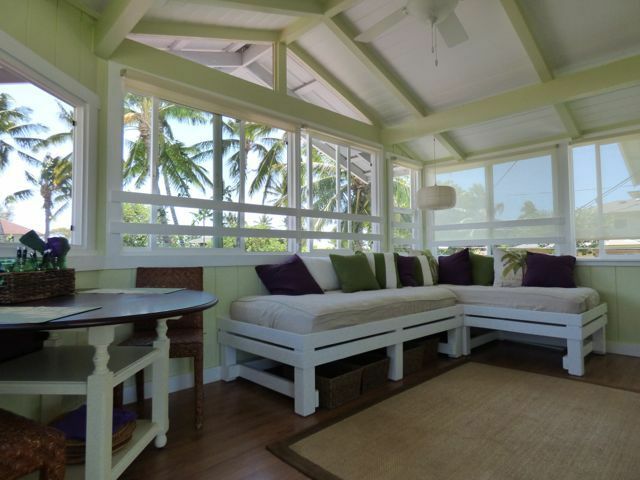 Peg and Bud’s Puako Tree House is a superb location to explore the Kohala coast and nearby resort areas. We truly enjoyed our stay here. Terrific place in all respects. Very private, spacious, very decorated and equipped. The owners, Peg and Bud, live in the main house and are great. They could not be nicer and more helpful. The location is ideal in Puako, a quiet residential beach community between the resorts of Mauna Kea and Mana Lani. Absolutely perfect for our one week stay on the Big Island. Our cottage on Puako Beach Drive was perfect for our stay. It was nicely decorated with a lovely peaceful location surrounded by palm trees and flowering bushes. We did not get to meet Peg as she was out of town but Bud and his friend Greg could not have been nicer. The cottage is located close to the most beautiful beaches on the island, Hapuna, 69 and Mauna Kea for swimming. Just across and down the road a few feet is the Puako Bay beach where the sea turtles hang out. It is a gorgeous spot to take in the view and for sunset photos. The weather was sunny and warm every day. The location allowed us to explore many areas of the island within easy driving distance. We miss it already. Lisa, thank you so much for the lovely review and we are delighted that you enjoyed your stay in Puako. I personally, am very happy you enjoyed my dad's company. He is a great story teller and loves visiting with our guests. Please think of us again when you return to Hawaii, we love our repeat guests! Puako is located 15 miles from the nearest town with medical services, groceries, restaurants. We have a small store in Puako where you can find items to hold you over until you do your grocery shopping. We are walking distance to the Mauna lani resort along the road and beach. About 25 mins. There you will find restaurants, shopping etc. Our guest love to explore the Island and find Puako the perfect location to begin their adventure.